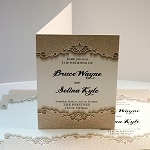 Elegant and classy 10x7 invitation printing (closes to 5x7) for your special occasion. From birthday to wedding to holiday party invitations, graduation or baby shower and birth announcements, we offer high quality printing and finishing to ensure your invitation or announcement is top notch and gorgeous. 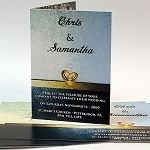 Printed full color on thick 16pt card stock for a beautiful look and feel. These invitations are design specially to be folded down to a 5x7. They come scored for easy folding. Serving the entire Metro Detroit region: Detroit, Grosse Pointe, St Clair Shores, Roseville, MT Clemens, Warren, Sterling Heights, Royal Oak, Ferndale, Birmingham, Troy, Southfield, Dearborn, Livonia, Canton, Westland and more. We also ship nationally via FedEx.